Home / Screening / Watch Friday The 13th Part 2 and Part 7 At 'Camp Crystal Lake At Rocky Woods Reservation' This October! Watch Friday The 13th Part 2 and Part 7 At 'Camp Crystal Lake At Rocky Woods Reservation' This October! Coolidge Corner Theater has been screening Friday The 13th films at their location for a number of years, including the original 3-D presentation of Friday The 13th Part 3 a few years ago. Last year the theater partnered with Rocky Woods Reservation once again to screen films from the franchise offsite with their annual event Friday the 13th: Camp Crystal Lake at Rocky Woods Reservation. This year marks the third time fans will have the opportunity to watch select Friday The 13th films outdoors in a camp setting on the unluckiest day of them all! On Friday October 13th, the The Coolidge After Midnite film series will be screening Friday The 13th Part 2 and Friday The 13th Part 7: The New Blood outside on the big screen in an eerie outdoor night setting. Read on for more information about the screening event and visit www.coolidge.org to find ticket prices and location information. The nightmare returns! 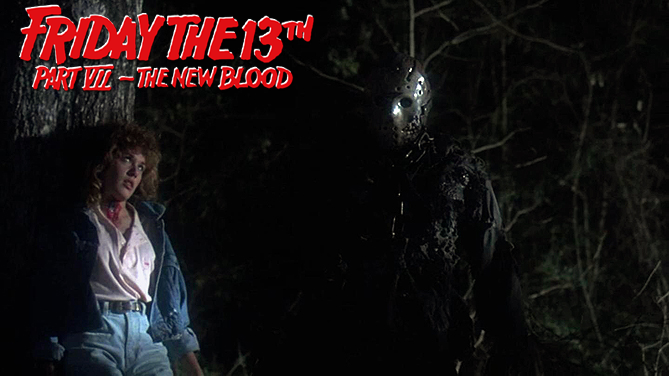 We're proud to present another terrifying off-site outdoor double-feature of Friday the 13th Part 2 and Friday the 13th Part VII: The New Blood on Friday, October 13th! Because nothing this evil (or this fun) ever dies! This highly immersive film-going experience puts you at the Rocky Woods, in Medfield, MA, watching two of the most iconic Camp Slasher films in cinema history! Expertly projected onto a giant screen set up right beside a pond eerily similar to the infamous Crystal Lake, you'll feel like Jason is lurking just behind the trees as you watch him draw his very first blood (Part 2), and return from his watery grave (Part VII). The Coolidge After Midnite film series is proud to partner with the Trustees of Reservations for this one of a kind event! Camp sites are available! Register with the Trustees directly (charlesrivervalley@thetrustees.org) for details!